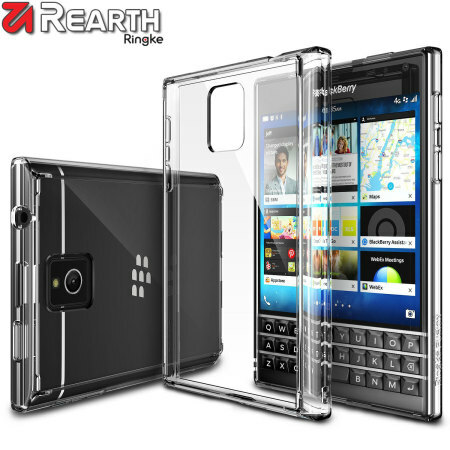 Protect the back and sides of your BlackBerry Passport with this incredibly durable and clear Fusion Case by Ringke. Excellent product, precision engineering, good design and quality material. Completely satisfied. Fantastic looking case with great protection for my phone! This case looks very cool and smart. It's sturdy too, guaranteeing my phone will be undamaged if I am unlucky enough to drop it! Good value for money also. Awesome service and speed of delivery from Mobile Fun, as always!! Manufactured from a combination of materials, the Ringke Fusion Case protects the back and sides of your phone from accidental bumps, drops and scrapes. The tough plastic back will save your BlackBerry Passport from accidents without adding excess bulk to your device while the edging will not only protect against impacts, but also makes the case easy to fit. Designed to complement the unique styling of the BlackBerry Passport's back, the Ringke Fusion Case is completely transparent and slim - which allows you to see the key finishing details of your BlackBerry Passport and enjoy fantastic protection. The shell has all of the appropriate cut-outs for the ports and features of your BlackBerry Passport such as the camera with flash, volume controls and lock switch. The simple slip on design allows for easy installation and removal if necessary. It features a special coating on the inner of the case, which prevents the case from scratching the back of your phone.